In some ways, the Los Angeles Metro Rail began with a misstatement. At least, that is how Tom Bradley described it. On May 23, 1973, Bradley, a Los Angeles city councilman, was in the midst of a bitter campaign for mayor in a rematch against incumbent Sam Yorty. A week before the election, Bradley called a press conference to emphasize his transportation agenda for the city. In this famous car town, transportation had become a dominant issue. Angelenos were facing higher fuel costs, traffic nightmares, and hazardous smog, and many viewed rail as the solution to these problems. Bradley shared this belief in the benefits of rail. He made the creation of a subway system his top political priority and became its leading founder. As he had demonstrated throughout his life, he was tenacious and determined to see it happen. After all, Bradley was the son of a Texas sharecropper and the grandson of former slaves. His family had moved to Los Angeles when he was a youth, and this ambitious young African American man became high school class president and an all-city football player. He joined the Los Angeles Police Department in 1940 and studied at night to earn his law degree. In 1963, he was elected to the Los Angeles City Council. Perseverance and overcoming adversity were in his nature. But giving speeches was not. His career as a police officer had not afforded him many opportunities for public speaking, and early in his political career he would simply stand and read speeches word-for-word. Although he developed more confidence over the years, he often found himself caught between reading and trying to speak from memory as he looked out at the audience. So as reporters in the press conference peppered Bradley with questions, he told them that his number one priority was "to get Los Angeles moving on a rapid transit system," and he criticized the "twelve years of neglect and lackadaisical leadership from Sam Yorty." By contrast, Bradley blurted, he would start construction of a high-speed rapid transit system "within eighteen months" of the day he took office. He immediately regretted making such an unrealistic promise. The night before the press conference, he later claimed, his aides had presented him with a plan to begin groundbreaking on a subway within eighteen months. Bradley looked at the eighteen-month reference in the policy statement and told his staff to remove it. He knew that the city could not begin work on a project of this magnitude so quickly and called the time frame a "dangerous statement to include." But under the glare of the media lights at the press conference, the eighteen-month time frame "had been so firmly embedded in my mind that it popped out almost spontaneously." In the coming years, as Bradley engaged in an all-consuming effort to achieve political consensus on the route of a new rail transit system for Los Angeles and to secure the billions of dollars in federal, state, and local funds to build it, he found himself plagued by the promise of the deadline. "From that point on," he lamented, "I was never able to get away from it." Bradley beat Yorty in the election of 1973 and became one of the first African American mayors of a major city. He immediately assumed a stature of national significance-one that he would capitalize on in his efforts to bring rail to Los Angeles. With his shy demeanor, he was not a typical politician, and he towered over most people with his tall, athletic frame. His former chief of staff, Ray Remy, noted that his taciturn and aloof demeanor during meetings led people to call him "sphinxlike." He was unfailingly polite to all who knew and worked with him and took a conciliatory approach to leadership that his critics described as cautious. "Tom's very nature as mayor," Remy observed, "was that he tried to find consensus and bring people together. He didn't twist arms but did a lot of 'let's reason together.'" Bradley had been a booster of public transit from the beginning of his career. He helped spark legislative action in 1971 to amend the state gas tax law to allow its use for public transportation projects-a change that proved crucial to funding the future rail system. In his bid for mayor, Bradley promised voters a world-class rail system for an emerging world-class city. His public advocacy framed rail as a solution for most of the region's ills. A subway would bring the city status, traffic relief, economic prosperity, environmental benefits, and good jobs. He believed that a subway would "make Los Angeles an accessible city" and give it equal stature to other major cities around the world. "Los Angeles is the last of the great cities of the world to secure an underground rapid transit system," he lamented. To his supporters, this new mayor was a visionary with strong ambition. Supervisor Ed Edelman, who served with Bradley on the city council, described him as someone who "looked ahead to what the area needed and wasn't just interested in looking good. He wanted to accomplish something." He was also a New Deal-style Democrat, and he viewed rail as an economic stimulus tool that would create high-paying construction jobs and stimulate economic activity through station-area real estate development and by leveraging federal funds. As a result, he had strong support from labor leaders. In addition, Bradley believed a subway would benefit citizens' quality of life because it "will impact the economy, permit people to move from jobs to homes, reduce the headaches of traffic congestion and it will reduce air pollution." Bradley was sworn in as mayor by U.S. Supreme Court chief justice Earl Warren, who wrote the Brown v. Board of Education decision that ended segregation in the United States. In his inaugural address, Bradley vowed to make transportation his number one priority. He worked immediately to line up funding for rail. But he also publicly backed off the eighteen-month pledge and promised instead that groundbreaking on the subway would happen within four years. Bradley needed to marshal all sources of funding for rail, from the city, county, state, and especially the federal government. The federal government had been offering significant funding for rail since the early 1960s, when President John F. Kennedy proposed a program of federal investment in building urban mass transit systems. In 1964, a coalition of local governments, downtown business interests, and labor groups pushed Congress to set aside $500 million for capital investments in cities across the country. By 1970, this coalition had grown to include the burgeoning environmental movement, and Congress and a receptive President Nixon increased the funding level five-fold. The federal offer was generous: if a city could find 20 percent of the funds to build a rail system, the U.S. government would provide the other 80 percent. Local transit agencies would have to apply to the Urban Mass Transportation Administration (UMTA), a division of the U.S. Department of Transportation, which decided the allocation of federal grants on a competitive basis. Federal funding for mass transit was now comparable to that for interstate highways, which received 90 percent of their funding from Washington. However, the era of federal largesse was ultimately brief when it came to investing in the country's urban transit infrastructure. Bradley immediately tried to assemble a grant package for UMTA. He would need both the 20 percent local match and a plan for a rail route that had broad political support. He worked to secure state gas tax funds for the local match, using Los Angeles County's share of the state gas tax revenue and traveling repeatedly to Sacramento to lobby the state legislature to commit state gas tax funds to the project. But the gas tax alone would not be enough. So Bradley decided to place before the county voters an initiative to raise the sales tax 1 percent from the then-current 6 percent to fund rail. The state legislature had authorized such a tax in 1964 when it created the Los Angeles County transit agency, called the Southern California Rapid Transit District (RTD). Bradley decided to use his influence on the RTD to get the agency to place a measure on the ballot. As mentioned in the introduction, RTD leaders had tried this approach before without luck. In 1968, the agency placed a half-cent sales tax measure on the ballot to fund a sixty-two-mile rail system, which voters rejected. Bradley, however, hoped that the wave of political support that elected him would translate into a sales tax victory. Voter approval of a sales tax hike would at once secure the local match and demonstrate to the federal government that the region was committed to mass transit. Bradley recognized that winning support from a county as diverse and enormous as Los Angeles would require a "balanced" plan involving roads, buses, and rail. The RTD therefore drafted an initiative that would dedicate half of the sales tax revenue to county buses and the other half to a 145-mile rail transit network. The plan would appeal to county bus riders and rural voters who had no interest in a downtown-oriented rail system. Bradley felt that having the vote within eighteen months of taking office would partially fulfill his eighteen-month campaign promise. Bradley began campaigning for Proposition A, as the sales tax measure was designated, and forged a coalition of downtown business leaders, civic organizations, and labor groups, as well as some of the leading politicians in the region and state. His strategy was to keep the rail route as vague as possible to avoid creating political controversies, advocating for fixed guideway service (without specifying the technology) in eight broad, heavily traveled corridors. Publicly, he tended to focus as much on the countywide expanded bus service as on the rail plan. Proposition A supporters unveiled a modest media campaign to earn public support. It included just a few television and radio advertisements and a direct mail campaign. But the media efforts appeared to be hamstrung by the vagueness of the rail plan. Because Bradley had kept the details vague to gain consensus, the overall media message to the public was not specific enough to be effective. The television campaign centered on one sixty-second celebrity spot featuring actor Jack Lemmon standing next to a freeway jammed with cars during rush hour. Lemmon looked into the camera, extolled the benefits of public transportation and how badly Los Angeles needed it, and recited the theme of the advertising campaign for Proposition A: "The time is now." But rail critics soon began to surface. Most influential among them were transit experts in government and academia whose studies of the economic value of rail led them to believe that rail was a poor investment. Their opinions carried political weight because the media often trumpeted their conclusions to the voters. As one example, Peter Marcuse, a Los Angeles City planning commissioner and a professor of urban planning at UCLA, came out strongly against rail transit in Los Angeles in the spring of 1974, with a detailed critique of the rail plan entitled "Mass Transit for the Few: The Case Against the SCRTD Plan." He criticized the proposal for, among other things, involving a regressive sales tax, promoting sprawl by making it easier for people to live outside the city center and commute by rail to work downtown, and benefiting primarily middle-class riders and wealthy real estate owners. A nervous Norm Emerson, one of Bradley's advisors, described Marcuse's critique as a "potentially damaging piece." Although "many of [Marcuse's] points are valid," Emerson wrote in a memo, he worried that "public consumption [of Marcuse's findings] could be harmful to our efforts." As the campaign reached its closing days, Mayor Bradley dedicated himself to campaigning throughout the county. He delivered speeches in favor of Proposition A that he tailored to each county region. On the Eastside of Los Angeles, Bradley touted the plan for rail stations that would link to employment centers in downtown Los Angeles and Orange County. For the high-bus-ridership areas of South Central, Watts, and Compton, the mayor spoke of those communities' dependence on transit and how "residents will be able to get to employment, medical and recreational areas much easier than ever before," as well as the new jobs that the rail system would create. The poor reputation of the RTD, however, started to undercut Bradley's carefully honed political outreach. The RTD experienced a sixty-eight-day bus driver strike in 1974 that crippled the county's transit system, and most Angelenos appeared to blame the RTD. Bradley tried to disassociate the rail plan from the controversy. "Proposition A and the bus strike are two completely separate issues," he told audiences. "One dealt with working conditions, and one deals with solving traffic problems. I hope that you see the difference." The voters of Los Angeles County did not. In November 1974, they narrowly rejected Proposition A, with 47 percent in favor. It was a stinging loss for Bradley, who had spent much of his first year and a half in office campaigning for the measure. The defeat also jeopardized the local matching funds and sent a signal to UMTA that the region was not yet ready for rail. The mayor publicly blamed the loss on antitax sentiment and a lack of confidence in the RTD. He argued that Proposition A was the victim of "bad timing," because "people got their [property] tax bills the weekend before the election" and were therefore unwilling to vote to raise taxes. He could just as easily have blamed the enormous size of Los Angeles County, which contained a significant population of voters who lived far from the proposed system. Noting that 57 percent of the people in the city of Los Angeles voted in favor of the plan, Bradley remarked that the proposed rail system "did not go into every neighborhood, and where it did not run in front of somebody's door, they simply were not that enthusiastic about supporting it." Bradley soon emerged with a new, less ambitious plan. As he later explained, "Since we couldn't get support for the entire system-and it was proposed for about 142 miles ... we then said, let's take a more modest step. Let's try to develop plans for a starter line, something less than the full system." Bradley hoped to build the rest of the system in successive stages from this starter line. The problem with Bradley's "modest step" was that a smaller route meant less benefit to the region as a whole. Keeping a political coalition together for a large rail route was much easier than for a small one because many politicians would see rail coming to their districts. If Bradley's starter line were to succeed, he would need the support of the powerful county supervisors. That meant pleasing Baxter Ward. In 1972, Baxter Ward, a local KABC Channel 7 news anchor, won a coveted seat on the board of supervisors, representing the fifth district, which covered the northwestern part of the county from the San Fernando Valley to the Ventura and Kern County lines. The board of supervisors was an elite club. In the mid-1970s, just five elected supervisors governed the seven million people living in Los Angeles County. Called the "five little kings" owing to the size of their districts and the relative electoral safety of their seats, they represented more constituents than all but eight U.S. governors and spent twice the money annually as the governments of El Salvador, Nicaragua, Honduras, and Costa Rica combined. They also functioned as both the executive and legislative branches of county government, which meant fewer checks on their authority. Ward became the critical swing vote on the five-member board, often forming a bloc with fellow supervisors and registered Democrats Ed Edelman and Kenneth Hahn to support rail efforts. By virtue of his powerful position, Ward quickly became an important player in the debate over transit in Los Angeles. Ward also loved trains. He had fond memories of riding them as a child, and he even had a large model train running in his office. Shortly after joining the board, Ward convinced his fellow supervisors to purchase a historic train to run on existing freight track in the county. Critics ridiculed the plan as "Baxter's Choo-Choo." Because Ward had helped Edelman during his campaign, Edelman felt compelled to vote for the plan as the deciding third vote. "So he bought this cockamamie train," Edelman later recalled, "and it turned out it had all sorts of problems. Eventually it was sold." Ward's ambitions for rail in Los Angeles differed markedly from Bradley's. Ward wanted a regional rail network to resurrect the defunct Pacific Electric routes and was not interested in Bradley's downtown-centered subway. He proposed using existing rail rights-of-way, such as the ones in use for freight operations and the abandoned Pacific Electric tracks. Ward advocated for a cheaper aboveground rail system that could be built faster and cover more of the county. Ward and Bradley's competing priorities were on a collision course. In May 1975, President Gerald Ford's secretary of transportation, William Coleman, privately indicated to local officials that a Los Angeles rail project would be "within the ability of UMTA to fund." But Coleman also warned that "Los Angeles should choose a starter line corridor within 60-90 days" or else the federal government would not consider the city when allocating the funds. The city and county moved quickly to arrange some funds for the local match, with the Los Angeles City Council and the board of supervisors setting aside their respective shares of the Proposition 5 gas tax money (a statewide initiative to dedicate gas tax revenue to mass transit, approved by the voters in June 1974) for the rail line. Choosing a route would require consensus. The RTD staff sketched a broad corridor from Canoga Park on the west end of the San Fernando Valley, east through downtown Los Angeles, and then south to Long Beach at the southern end of the county. This corridor touched some of the primary power centers in the county but seemingly had little to do with the densest population centers of the county, including most if not all of Wilshire Boulevard. The RTD had literally painted with a broad brush over the county map, "to let the federal government know we're in agreement on a 'broad' corridor," commented RTD general manager Jack Gilstrap at the time. Hoping this vague corridor would be sufficient for the Department of Transportation, RTD president Byron Cook submitted the plan to Coleman within the ninety-day deadline. He informed Coleman, however, that "specific route alignment, configuration, station locations and transit mode" still needed to be determined by local leaders. Cook's submission qualified Los Angeles to apply for UMTA funding within the year, although local leaders still needed to offer more specificity. But Ward and Bradley disagreed on the route details. Bradley advocated a downtown- and Hollywood-based route via Wilshire Boulevard that would serve the major population and political centers within the city. Ward proposed a suburban-oriented rail line that would mostly serve commuters coming into downtown from far away. "The bigger the starter line," Ward said, "the better it can serve the county." The conflict between the two leaders became personal. Ray Remy, Bradley's chief of staff, described the relationship between them as "strained." Bradley had not forgiven Ward for attacking the mayor publicly on his transportation plan. "Baxter fought Tom very vigorously on all of Tom's proposals," Remy noted. "Baxter was constantly trying to get commitments away from the Wilshire line" because "Wilshire was not part of Baxter's district." Remy believed that Ward's background as an investigative reporter gave him a more confrontational approach to politics. "It was such that people got annoyed with him," he observed. The Bradley-Ward impasse motivated state leaders to intervene in the dispute over the rail route before the UMTA proposal deadline. California governor Jerry Brown sent Donald Burns, secretary of the Business and Transportation Agency, to organize meetings with the key local players to develop consensus. On November 21, 1975, Bradley, Ward, and other rail leaders met in the California Highway Commission Room in Los Angeles to negotiate a starter line route. The organizers dubbed it a "transit summit," and it quickly became a game of political negotiation rather than a merit-based analysis of which rail routes could serve the most people. At the summit, Ward offered a compromise that would start the first phase of the starter line with a route from Long Beach to Union Station in downtown Los Angeles. The second phase would travel from Union Station through his district in the San Fernando Valley. He was willing to start with Long Beach, even though it was far south of his district, because the starter line advocates needed Long Beach's portion of the state gas tax revenue to fund the line. As a major economic center within the county, Long Beach could potentially contribute an estimated $2.9 million over five years. Ward argued that his plan would "incorporate Long Beach's money, solve their problem, solve [Mayor Bradley's] problem in South Central Los Angeles and also serve a large portion of the Central Business District to the tunnel." He concluded by stating that his plan "solves our problem for money today" and represented a "compromise of the needs, aspirations." Mayor Thomas Clark of Long Beach extolled the political benefits of Ward's proposal. Of the twenty-five miles along the route, he argued, "Long Beach has six, Los Angeles has over twelve and the County has almost four. So everyone is basically getting something out of that starter line ... It's the only line I see that everyone gets something out of politically." Turning to Bradley, Clark said, "I don't know, Tom, if you get enough out of it politically or not, but you have over twelve miles, 48 percent of that's in the City of Los Angeles." Mayor Bradley was not convinced. "It just leaves me out such a large segment that it's going to be hard to convince our Council on it," he said. "I've been trying to quickly look at the patronage figures for each of these options," he continued. "In our first effort we're going to have to try to do something that represents a successful demonstration. If we ever hope to expand it we want to do a good job on that first phase." Ultimately, however, Bradley accepted Ward's compromise offer in order to reach a consensus. The leaders unanimously agreed that the first segment of the starter line would stretch from downtown to Long Beach. Burns presented the consensus to Secretary Coleman on December 16, estimating the line to cost over $900 million. Finally, after protracted negotiations with UMTA, by September 1976 the RTD grant application to fund studies on the starter line route was out the door. Ward did not want to wait for UMTA to decide on the starter line proposal. "It would be tragic," he said, "if we were to allow ourselves to become delayed trying to collect enough money to build a small but gold-plated project. Such a process would be a betrayal to the people we are expected to serve." He announced a plan for the June 1976 ballot: a one cent sales tax increase to finance the development of a 260-mile (later pared down to 232-mile), multibillion-dollar regional rail network. Ward believed that state gas tax funds and federal matching dollars would be insufficient to begin a regional system within the next two decades. His plan envisioned using freeway, flood control channel, and railroad rights-of-way exclusively to develop a $7.5 billion light rail network. It would interlock with a future subway starter line and the potential Orange County regional rapid transit plan. The rail lines in his proposal covered virtually all of the city of Los Angeles and its neighboring cities. Harkening to his boyhood days riding the rail, Ward called the project the "Sunset Coast Line." In the proposal, he wrote: "Because the heart still returns to the rails, people still talk about the [Pacific Electric] Big Red Cars... . The Sunset Coast Line brings all that talk and nostalgia and hope together." Referring to the air quality problems in the Los Angeles Basin, he observed that "there is not a flicker of feeling for the bus. Their fumes add to our problems with the air." He argued that his plan would solve many problems, from "protecting the natural environment, enhancing the man-made environment, improving the level of movement ... [and addressing the] uncertainty of energy supply." The proposal had one serious flaw, however: it was completely unworkable. The cost and revenue figures did not add up, and Ward had neglected to include anyone else in developing the routes or the financing calculations. Even Ward's staffer Jonathan Beaty admitted that the plan was a "conceptual proposal with innumerable problems that have not been addressed." Despite the many questions surrounding the plan, Bradley and other rail leaders reluctantly announced their support for placing it on the ballot. Facing reelection in another year and needing some kind of victory on transit, he described Ward's plan as another part of the strategy to combat gridlock. His press release stated that the proposed Sunset Coast Line "fits nicely into the balanced concept," and he emphasized the "big transportation picture" that he had "advanced over the past three years," including the starter line and the other minor transportation fixes. Ward's two half-cent propositions became "R" and "T," for Rapid Transit. (He needed two separate propositions to achieve a full cent increase because state legislation only authorized the RTD to issue half-cent measures, and Ward failed to convince the state legislature to allow for consolidation in time for the ballot printing.) Ward mobilized supporters, organizing a coalition that included leading businesses, labor, and local elected officials. Rail opponents also mobilized. They included economic conservatives, academics, and the Los Angeles Times. Most of the opposition centered on the expense of the plan as well as its flawed details. Ward's fellow supervisor, Pete Schabarum, led the opposition. Schabarum was an archconservative who did not like tax increases and did not want the government to build large projects like rail. A former college rugby player and halfback for the San Francisco 49ers football team, he went by the nickname "Pistol Pete." One county official described Schabarum as "competitive as hell." He had gained local notoriety for bowling over a fifty-year-old, five-foot-tall grandmother playing catcher during a softball game. Even after she was carted to the hospital, an unrepentant Schabarum said, "The lady was standing flat square in the middle of the plate." "Pistol Pete" took the offensive against the Sunset Coast Line, which he deemed to be a symptom of wasteful government spending financed by unnecessary taxes. Schabarum lobbied local leaders to oppose it, ridiculing Ward's proposal for having "beautiful renderings" that masked "a New York-like financial crunch" and the possibility of "cost overruns similar to BART," the San Francisco Bay Area rail system that had dramatically exceeded its cost projections. Schabarum, like many other economic conservatives, preferred an all-bus alternative to the transit gridlock in Los Angeles. An all-bus system was "much less costly," and he argued that rail offered "no transportation service advantages" over bus. "California communities, which grew up in an automobile age, apparently cannot easily be served by a rapid transit system modeled after those of eastern communities that developed in a horse-and-buggy age of high population density," he said. "Rail transit is a thing of the past and should be relegated to plywood boards in dens and garages." Transportation experts in the academic community largely agreed. They almost uniformly disapproved of rail on economic grounds, believing it be a bad investment because it required heavy subsidies to operate and because buses and other low-cost methods offered far cheaper means of moving people around. Peter Gordon, a libertarian professor in the business and economics department at the University of Southern California (USC), attacked the Sunset Coast Line as part of the "take-over by the public sector of urban transportation facilities" and an "almost reflexive response to the decline of private transit operators." He described rail as an "absurdity" offering "the fewest benefits at the highest costs," asserting that the reality of rail's flaws had not "grasped the imaginations of the fervent advocates of rail transit for Los Angeles." An equivalent investment in highways instead of rail, he argued, would create more jobs and greater stimulation to the economy. "It is rare that society attempts to reverse the decline of an industry that is 'flunking the market test,' and properly so." A one-day conference of local scholars, held at USC in 1976 to discuss Ward's proposal, produced similar conclusions. Proclaiming that they brought a "close and detached look at the transportation problems of this region," the professors believed they had "something important to communicate to society at large." Robert Ellickson of USC's Law Center alleged that rail advocacy resulted from the backroom lobbying of construction and design industry profit-seekers who could no longer make money from highway construction. According to Ellickson, they joined environmentalists to lobby for rail for profit. Professor Martin Wachs of UCLA claimed that "many Southern Californians are victims of a 'cultural inferiority complex': they believe that they will not have achieved true 'citihood' until they, too, have a subway system." Jack Dyckman of the USC planning department questioned whether Los Angeles had a transportation "problem" in the first place. Commuters, Dyckman argued, "appear well served by the present system." The negative reviews by academics convinced the Los Angeles Times to run a series of damaging articles on Ward's plan just a few weeks before the election. The seven-article series challenged virtually every positive assumption about the impact of Ward's plan. Entitled "Rail Rapid Transit: The Doubts Persist," the series questioned the need for rail transit in Los Angeles and quoted Dyckman, who asserted that Los Angeles "already has a good flexible transportation system-its freeway network." The newspaper discredited the idea that the Pacific Electric cars were worth saving. It quoted UCLA economics professor George Hilton, who argued that the demise of the rail cars was "no cause for regret" and that "efforts to upgrade it would have amounted to a pure waste[,] for ... the operation could have yielded no substantial external benefits." Even in cities with rail transit, such as the San Francisco Bay Area, the paper claimed, traffic had declined by only 2 percent. It finished with a quote from USC urban regional planning professor Harry Richardson: "To pay billions for half-empty trains and half-empty freeways hardly seems a wise investment." An exasperated Ward called the series "one hell of a hatchet job." But the negative press may have influenced the public. On Election Day, June 8, 1976, Los Angeles County voters rejected the Sunset Coast Line by a three-to-two margin (59.3% to 40.6% opposed). Although a poll taken two weeks before the vote showed that a bare 50.2 percent favored it, after the Times series that support collapsed. It was a traumatic defeat for Ward, who proclaimed that rail transit in Los Angeles was "dead." Years later, a newspaper reporter caught up to Ward, then retired from office, to ask him his thoughts on transit in Los Angeles. When the subject of the Sunset Coast Line came up, Ward said, "I had a disaster on my hands," and he called the battle "the single most difficult thing I have ever done in my life." Perhaps imagining the rail cars of his youth on the old Pacific Electric line, he said to the reporter, "If you saw how logical it could have been ..."
Ironically, the defeat of the Sunset Coast Line boosted the prospects for the Starter Line, which emerged as the only proposal left standing. And the presidential election that November brought high hopes for rail leaders in Los Angeles. President-elect Jimmy Carter had developed a close relationship with Tom Bradley and Ed Edelman, and they considered him a key ally in their agenda for Los Angeles. More good news for rail advocates came in the form of a parting gift from the outgoing secretary of transportation. Just weeks before Carter's inaugural, Secretary Coleman told the RTD that UMTA had officially approved the Los Angeles application for federal dollars to study a starter rail line and was awarding the transportation district $2 million to do the initial engineering and environmental work. He warned Los Angeles, though, that the award was not a guarantee that the federal government would approve further funds. He also limited the area of study. "We conclude that further study of fixed guideway alternatives in the Wilshire/La Brea corridor-but only in that corridor-is merited," the secretary wrote to Mayor Bradley. Rail advocates would need all $2 million of the grant. The process of conducting a rail study was no longer a simple matter, as UMTA was now requiring cities to undergo "alternatives analyses" in which local officials studied various transit alternatives to rail along the proposed routes. The hope was that some local governments would realize that cheaper options, such as light rail or bus-only lanes, would work better. UMTA had adopted this new requirement in September 1976, and Los Angeles was the first city to be subjected to it. The region had missed the window of an easier federal rail process. The UMTA grant was a milestone for the city and good news for Bradley with his reelection year approaching. He described the award in a press release as "a giant step forward for Los Angeles," arguing that an improved transit system would make Los Angeles "a more attractive place to locate businesses" and would improve energy conservation, air quality, and traffic congestion. The award was also a victory over Baxter Ward. The Wilshire corridor was the most densely populated part of Los Angeles and the part of the city most suitable to rail. The federal government was now in agreement with Bradley and the RTD that if there were to be rail in Los Angeles, it should serve the areas of density rather than the vast reaches of the county as Ward wanted. But Coleman warned Bradley that the federal government would not want to commit millions of dollars to a Los Angeles system "if a consensus for meeting future transit operating cannot be achieved." With expectations running high, opposition suddenly emerged from an unexpected and powerful place. President Carter, it seemed, turned out to be no fan of urban rail. As governor of Georgia, Carter had helped Atlanta finance a new rail transit system called MARTA (Metropolitan Atlanta Rapid Transit Authority). Like Los Angeles, Atlanta suffered from traffic caused by its dispersed, auto-dependent population. Although rail boosters hoped MARTA would spur density through development around the rail stations, the appropriate zoning changes never happened for political reasons. Carter's experience with the system was causing him to think twice about funding new rail programs in auto-oriented cities. In 1977, the president wrote in a leaked memo: "Many rapid transit systems are grossly overdesigned. We should insist on off-street parking, one-way streets, special bus lanes, and surface rail-bus as preferable alternatives to subways. In some urban areas, no construction at all would be required." Carter was beginning to sound worrisome to rail advocates. Carter's secretary of transportation, Brock Adams, was also dubious about rail in Los Angeles. The generous federal support for rapid transit in the late 1960s and early 1970s had yielded disappointing ridership results, and rising costs had forced UMTA to make cutbacks and direct greater scrutiny on cities like Los Angeles. In April 1977, Adams told reporters that local officials in Los Angeles were "going to have to convince me that rapid transit is feasible" on the Wilshire corridor. He instead expressed strong support for more carpool and bus lanes in the freeway system as a solution to the traffic woes. In May 1977, the president himself weighed in on the subject during a visit to Los Angeles. He was taping a live interview show on KNXT television when Rick Arroyo, a twenty-five-year-old bus driver from East Los Angeles, asked him about rapid transit in Los Angeles and voiced concern about the "number of cars polluting the atmosphere." Carter answered by referencing his experience as governor of Georgia. He mistakenly compared the population density of Los Angeles to that of Atlanta, claiming that both cities had about 800 people per square mile, compared to Manhattan with roughly 20,000 people per square mile. "You really don't need the highly expensive subway and rail systems as much as some communities do," the president concluded. Carter's remarks sparked a local uproar. Rail supporters struggled to make sense of them. The president had misrepresented the population density of Los Angeles County, choosing a square-mile population figure that ignored the high-density corridors within the county that rivaled the densities of large East Coast cities. In fact, the Wilshire corridor had the fifth highest population density in the United States and was as dense as much of Manhattan, with over 15,000 people per square mile. Department of Transportation officials tried to contain the public relations damage done to rail boosters in the nation's second-largest city. Secretary Adams wrote to Bradley, "I want to assure you that this Department has an open mind on the question of funding rapid transit in Los Angeles." But the pattern of comments indicated that the Carter administration was reluctant to spend limited resources on rail in Los Angeles when cheaper alternatives existed. The remarks from Adams and Carter also exposed a split within UMTA about the desirability of funding rail in Los Angeles. UMTA's regional director for California, Dee Jacobs, favored federal funding of rail along the Wilshire Corridor, and he expressed consternation at the public statements of top leaders in the administration. "I'd hate to have the Secretary make too many statements in this vein," he wrote to UMTA's acting administrator. "Since he (nor Secretary Adams) has not received a briefing on the Los Angeles proposal from us, one couldn't expect the President to know that the Wilshire corridor is quite an exception to the conventional thinking that all of the vast, complex LA area is low density sprawl, unsuited for expensive, fixed guideway transit." Two years later, with the starter line studies almost complete, Secretary Adams voiced similar concerns. On a KNX radio show in March 1979, the secretary declared: "We tried and will continue to look at whether or not you can have a rail system in Los Angeles, but it's very hard to determine where you're going to build it, because the density is very light, and they want to look at the Wilshire Boulevard corridor and we have said you have to be very careful with that." Adams then reiterated his support for putting buses on freeways as a congestion solution. He recommended that Los Angeles try this approach first and "see how well it is working" while still pursuing a rail option. "You have such an elaborate freeway system you may want to go to bus on freeway rather than to rail as your ultimate public transportation system," he told listeners. The administration was sending mixed signals to Los Angeles. UMTA administrator Richard Page had already publicly sounded notes of encouragement for rail, and Dee Jacobs was a staunch supporter of rail along Wilshire. Jacobs wrote to Page to express frustration with the secretary's "off moment" and urged Page to "brief him on the L.A. situation. Statements like this hurt [Secretary Adams's] credibility. For example, all the political actors in the L.A. area plus most informed people now recognize that the Wilshire Corridor is one of the densest transit corridors in the nation, far exceeding anything we have in Miami, Baltimore, Buffalo and denser than virtually any other rapid transit corridor outside of New York City." The Secretary's comments were delaying UMTA action on the now-completed RTD starter line study. While Los Angeles leaders waited for the Carter administration to make a decision, Baxter Ward tried one last time to revive his rail dreams. He placed a nonbinding referendum on the November 1978 ballot with a plan for the "Sunset Coast Limited," a downscaled version of the Sunset Coast Line. The new rail system would cover fifty-seven miles, linking the San Fernando Valley, El Monte, Los Angeles International Airport (LAX), and Watts with downtown for a cost of $3.8 billion. Describing BART trains as "not exciting," he had the Sunset Coast Ltd. trains designed to have "domes" and to be able to "streak across the place." Once drivers in traffic "see a train going by at 80 mph," he said, "those people will be riding it the next day." The plan won 54 percent of the vote (although only 60 percent of individuals who voted that day actually voted for the measure at all). He hoped the 1978 advisory vote would set the stage for an electoral victory in 1979. He then returned in 1979 with another 232-mile light rail plan for the November ballot. But Ward had lost credibility. UMTA officials like Dee Jacobs were tired of him, referring to him as "the longstanding problem" who was once again "off doing his own thing, miles from the practical, fundable, reasonable improvements for which political and community consensus has finally been laced together." Even Ward's colleagues on the board of supervisors turned against him-and he needed their vote to place his plan on the ballot. Supervisor Hahn supported Ward, and it came down to Supervisor Edelman to provide the third, decisive vote. Edelman had supported Ward with the purchase of "Baxter's Choo-Choo," but he had had enough of Ward. He voted against the plan in order to focus on a Wilshire route, "where you had the density," he argued. UMTA interpreted the county vote as the beginning of a new era of political consensus in Los Angeles. Ward's competing vision for rail had been eliminated, and the major power centers now supported the starter line as the place to begin. "For years we have challenged the elected officials to get their act together-including political consensus and local financing-as a precursor prerequisite to federal financing," Dee Jacobs wrote to his superiors. "In the last three months they have done that and now are in the process of tossing the ball to us." In 1979, President Carter appeared to undergo a change of heart when it came to funding mass transit. With rising energy prices due to the Iranian revolution and hostage crisis, Carter suddenly recognized transit as an important investment in a slumping economy and a critical way to reduce energy consumption. In a speech before the American Public Transportation Association in New York in September 1979, the president said: "Now we recognize the value of mass transit. We stand committed to the rediscovery and revitalization of America's transit systems. ... We will build subways, elevated trains, trolleys, people-movers and commuter trains." He promised a "quantum jump" in transportation spending by more than tripling it for the 1980s. Los Angeles leaders submitted the final paperwork on the starter line in early 1980 with high hopes. RTD staff requested a preliminary engineering grant that would be the final step before beginning construction on the project, which would require yet another UMTA grant. The region had finally secured the state support necessary to guarantee the local match for the starter line, and Department of Transportation officials knew the ball was in their court. "For the first time in its rapid transit development history, Los Angeles will have a local commitment of over $400 million," wrote former Bradley advisor Norm Emerson, who now worked for the Department of Transportation. But it appeared to be too late. The Department of Transportation claimed that money for rapid transit programs had dried up with the weakening national economy. UMTA presently had roughly $1 billion to spend, but most of those funds were already committed to upgrading existing trains in New York, Chicago, and Boston. Local advocates doubted they would get full funding for the starter line, speculating that the federal government would probably require the RTD to divide the line into smaller, discrete segments to fund over time. The heyday of UMTA rail grants had ended. While Los Angeles voters were defeating transit sales tax measures and politicians fought over rail plans, UMTA committed to new rail programs in Miami, Atlanta, Buffalo, Detroit, and Baltimore. The only consolation was that most of the competition from other cities was gone. Honolulu was the only major city left that was still asking for rail money. The Carter administration recognized that transit needed more money. The president therefore proposed a Windfall Tax and Energy Trust Fund via legislation that would place a special tax on oil companies. The administration planned to use the revenues for infrastructure projects like the Los Angeles subway and other transit projects on the Carter wish list. On April 2, 1980, Congress passed a compromise version of the president's windfall tax bill, and Carter immediately signed it into law. Federal funds for systems like the starter line would once again be available. Carter duly promised local officials that UMTA would approve the starter line grant. Mayor Bradley tried to persuade the president to announce funding for the starter line before he faced voters in his primary race against California governor Jerry Brown and others. But the president resisted, concerned that such an announcement would appear political and therefore discredit the initiative. So a day afterthe June 1980 primaries (which Carter lost to Senator Edward Kennedy), Bradley and other rail leaders finally announced the news that they had waited years to receive: UMTA had awarded the $12 million preliminary engineering grant for the Wilshire subway. UMTA administrator Theodore Lutz described the project as a "careful, highly professional job." The money would pay for engineers to determine the soundness of the route and estimate the construction costs. Officials projected a 1983 or 1984 date to begin breaking ground. Bradley described himself as "elated" and pointed out that it was the first time in twenty years that there was a consensus on both the route and where the 20 percent local share would come from. When reporters reminded him of his eighteen-month pledge back in 1973, he smiled and said, "A lot of people thought, 'you've got to be loony to think this is going to happen.'" Local leaders had finally taken a major step forward in the fight to bring the starter line to Los Angeles. The familiar image of Los Angeles as a metropolis built for the automobile is crumbling. Traffic, air pollution, and sprawl motivated citizens to support urban rail as an alternative to driving, and the city has started to reinvent itself by developing compact neighborhoods adjacent to transit. As a result of pressure from local leaders, particularly with the election of Tom Bradley as mayor in 1973, the Los Angeles Metro Rail gradually took shape in the consummate car city. Railtown presents the history of this system by drawing on archival documents, contemporary news accounts, and interviews with many of the key players to provide critical behind-the-scenes accounts of the people and forces that shaped the system. 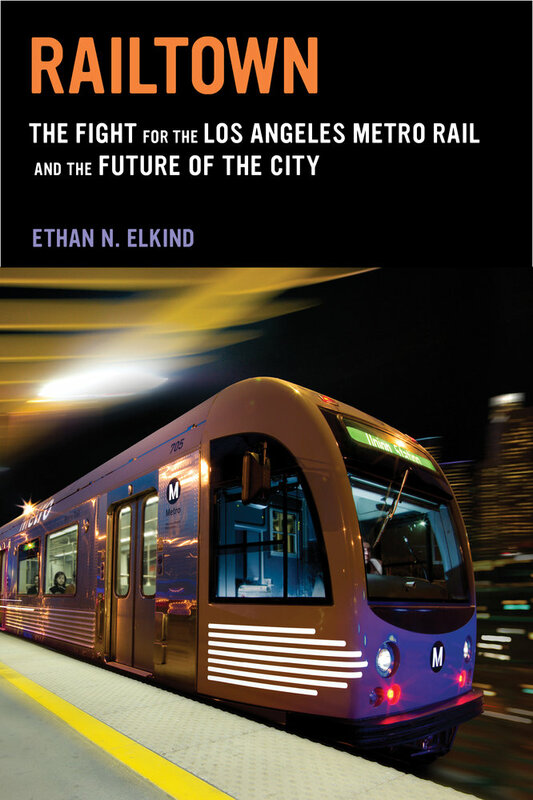 Ethan Elkind brings this important story to life by showing how ambitious local leaders zealously advocated for rail transit and ultimately persuaded an ambivalent electorate and federal leaders to support their vision. 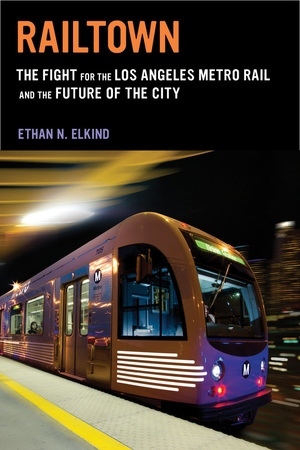 Although Metro Rail is growing in ridership and political importance, with expansions in the pipeline, Elkind argues that local leaders will need to reform the rail planning and implementation process to avoid repeating past mistakes and to ensure that Metro Rail supports a burgeoning demand for transit-oriented neighborhoods in Los Angeles. This engaging history of Metro Rail provides lessons for how the American car-dominated cities of today can reinvent themselves as thriving railtowns of tomorrow. Ethan N. Elkind researches and writes on climate change law and policy with a joint appointment at UC Berkeley School of Law and UCLA School of Law.